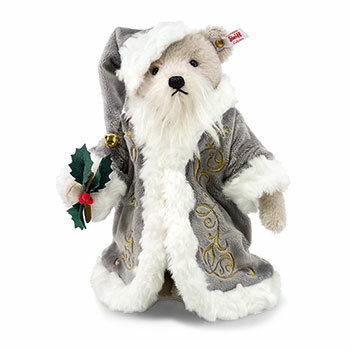 Steiff Christmas Teddy Bear Musical Discounts Apply ! Made from The Finest High Quality Cream and Silver Mohair. Height 28 cm / 11 inches Approx. �You better watch out, you better not cry ..." this season with familiar Sinatra song in tow is a particularly festive Christmas Teddy bear on his way to join Steiff collections the world over. Maybe your gaze is first attracted by his long beard of white, curly mohair. Then it wanders along the velvety, ornate gold embroidered coat, to the twig of holly with its characteristic red berries and airbrushed felted leaves. 5-way jointed with Safety Eyes and stuffed with Safety Filling, and with gold-plated "Button in Ear" with Wind up melody "Santa Claus is coming to town and Surface Washable.